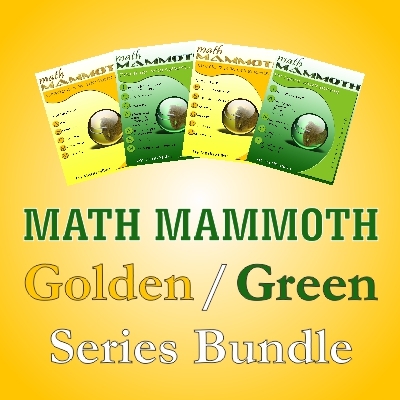 Get ALL of the Golden Series plus the Green series worksheet collections for a bundle price of $65 (download)! Math Mammoth Golden Series books are collections of worksheets for grades 3-8(9), consisting of two parts (A and B) for each grade. Each worksheet concentrates on one topic, but with very variable problems. These are not 'run-of-the-mill' math worksheets. 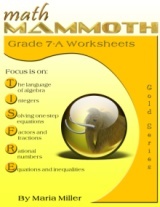 Each sheet in the Golden Series workbooks has been "hand-crafted", with problems that both emphasize understanding of concepts and practice computation, and also include various word problems. In essence, the problems in these books are like what you would find in a regular math book, and far from mechanical worksheets created by a script. You can get ALL of the above listed collections plus the Green series worksheet collections for a bundle price of $65 (download)! The PDFs in the download version are enabled for annotating. This means that the student can actually complete the PDF file on the computer, using the typewriter and drawing tools available in Acrobat Reader version 9 or higherm, or on a tablet device such as an iPad, using a PDF app that has annotating tools. The video below explains the basics of the Golden Series. I absolutely LOVE Mammoth Math! This series lays thing out in a very straight forward manner that makes it easy for a student to understand. I love the worksheets from the yellow and green series to help solidify my kid's understanding of specific topics. I especially love the decimal and fractions packets. This is my top go-to series for my children. Several things make the Worksheet Collection valuable. The problems under each title are sufficient in number to allow learners to absorb the lesson without getting bored. Consistency between books makes an easy transition from grade to grade. The mix of problems in a lesson keeps the interest of the learner. Yes, I am impressed. I am very interested in using the worksheets as a supplement next year. The formatting is great and everything appears to be well thought out including additional rules and tricks for making math more accessible to all. My name is Susan Greenwood and I am a 5th-8th grade math teacher at a small Christian school in New Jersey. Our school utilizes the A Beka curriculum exclusively, and after reviewing our state's core curriculum content standards for math, I was very motivated to find an inexpensive way to infuse the curriculum with more challenging material. At the beginning of the 07-08 school year, I sampled our state's standardized tests for each grade. We currently use a private company for standardized testing, however, our state tests are very challenging and my goal is to ensure that our students meet and exceed our state's requirement so that our students can be as knowledgeable as their public school counterparts. Therefore, I pre tested our children in September 07 at one grade level below their current grade, and the results indicated a lack of proficiency in several areas(operations, problem solving, integers, algebra). I immediately started my research on the Internet to find ways to enrich our current curriculum and stumbled on your web site which was very helpful and l led me to the Math Mammoth serires. There were sample pages available for download and I very pleased to see that your worksheets captured all the topics that I needed to make the curriculum challenging and complete. I used the worksheets in all grades and am pleased to say that we ended the year working on all the problem areas that were not addressed in the A Beka curriculum. This school year (08-08) brought its own set of challenges- a drop in enrollment and consequently a limited budget, led to the decision to combine classes for the 5th and 6th and the 7th and 8th. Using the A Beka curriculum was exhausting because it is very redundant and I felt that I was wasting time teaching concepts that were already learned and once again not introducing concepts that were crucial. Keeping track of 2 grades at the same time was also inefficient and exhausting for all. I then decided to buy the Math Mammoth CD (the Gold and Green series) on my own and utilize it exclusively for all grades. It has been a big hit with the children and my 5th graders are actually now working on the 6th grade worksheets along with the 6th grade! The workbook is very challenging for all the grades and I feel confident that the children are being exposed to all the math topics that they need to succeed when they get into high school. I am very pleased with Math Mammoth and have provided my principal with a recommendation that we discontinue our current curriculum next year, and buy the Math Mammoth for all our grades. Your web site has also been extremely helpful and I have utilized so many of your resources. Your web site and books have been a blessing! Thank you! I surfed the net looking for curriculum and found Mammoth math. I printed out the 5th grade triangles sheet and the fractions sheet. Her response: "These pages are FUN!" Why can't you use this for my math?" She wants to do more !!! because to her they are like "brainteaser" puzzles. Personally, I LOVE YOUR WORKSHEETS. Any worksheet that has my daughter begging to do more math is obviously well designed! Thank you! I just used these worksheets (from 7-A) for the first time today and they were a life saver. The seemed to help my students understand integers better. I used several of your worksheets this week at various levels and found them to be awesome! The questions were challenging in that students were required to think and not just fill in answers. Thank you for the opportunity to sample your work. I will definitely recommend your materials. I loved the worksheets!!! I do inhome tutoring and feel like I hit a goldmine! !